I bought some Sony gear in 1996 when I was in Tokyo. In some ways, this gear represents Sony at its peak, these designs have never been surpassed. And in other ways, it is all totally obsolete. But it continues to serve me well, so I thought it deserved a little homage. I was shopping in the consumer electronics stalls in Akihabara when this Sony SRS-T10 portable speaker caught my eye. The design was so compelling, it was a little round oval like a clam shell. It’s a limited edition that was never sold outside Japan. I asked if I could see it, the speaker opened up like a flower, I said it was beautiful. But the vendor said, “You don’t want to buy this, it sounds like crap!” I figured it was about as low-fidelity as I could tolerate, but at least as good as the speakers in a laptop. He insisted I hear it before he would sell it to me. The vendor loaded it with batteries and plugged it into a little CD player, I thought it sounded fine, considering how cheap it was, under $20. So I bought one, much to the exasperation of the vendor, he thought I was crazy to like such a piece of crap. I asked the vendor if he had anything that sounded better. He showed me a slightly bigger model, the SRS-T50. This model had more batteries and can pump out a lot more volume. 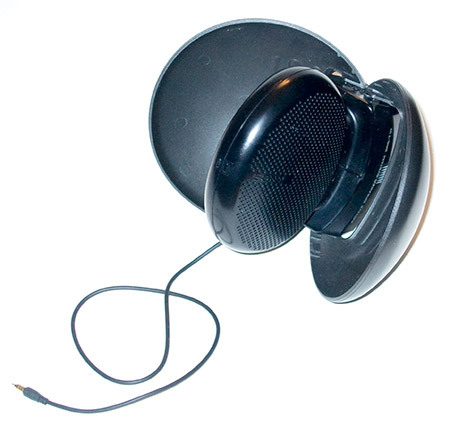 It uses the same basic design with little wings that fold out to reflect the stereo sound. But the vendor objected again, he said this speaker sounds like crap too. So once again, I had to hear it before I could buy it. I thought this model sounded pretty darn good, so I said I would take two of them, and again, the vendor growled with exasperation, I had to laugh. I gave one of these speakers as a gift to my brother, he said everyone asks where he got it, and comments on how good it sounds. 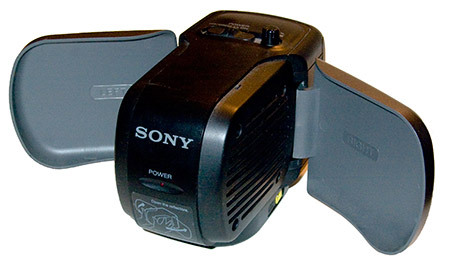 It’s a shame Sony never sold this particular unit in the US, they sold the same speaker in a garish yellow and grey “Sports” design that was a huge flop, I think it would have done better in the stylish Tokyo black and grey. My only problem with the design of the SRS-T50 is the placement of the power switch on the top. I throw this speaker in a bag or suitcase, the switch gets bumped and it powers on, wasting the batteries. So I usually just put a piece of tape over the switch before I carry it. That’s my pet peeve, I used to carry my CD player in my briefcase, the switches would activate, and by the time I discovered it, the batteries were exhausted. I looked around a long time for a CD player with no protruding switches, I was determined to find the ultimate design, it took a few weeks of research, but I finally found the Sony DiscMan ESP D-777. This was really what I’d gone into this store to buy, this premium CD player was hard to find and I’d spent weeks hunting for it. Now the vendor was quite pleased, he said, “oh yes, this really is excellent equipment, Sony’s best. But it’s quite expensive.” And indeed it was, for it had Sony’s latest design. 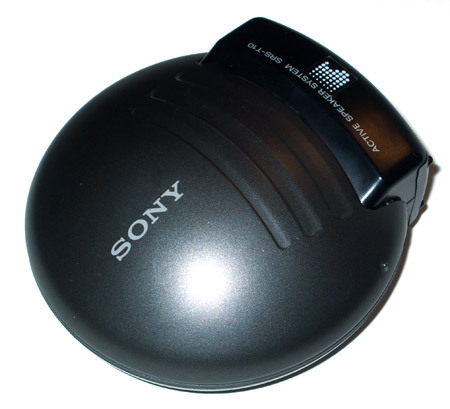 This was the thinnest CD player ever made, the smallest, most minimal mechanism that could play a CD, thanks to the new NI-MH battery design. 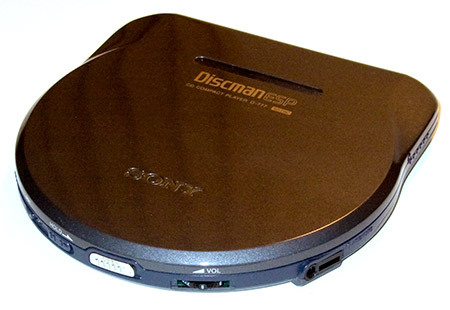 Previously the thinnest CD player had to be thicker than its AA batteries. Now it only had to be thick enough for the rechargeable NI-MH flat packs, about 2/3 less space. What really sold me was the remote. All the new music devices in Japan used little remote controller badges, you’d clip it on your lapel and plug your headphones into it. Then you could remotely control your CD player, skip tracks, adjust the volume, etc. without ever having to touch the player. You can see my remote buttons are worn down from constant use, but the player is in pristine condition. I used to keep the player in its case in my jacket pocket, with the badge clipped to my lapel. Everyone in the US asked what it was, there were no remotes like that available in the US yet. I remember paying about $200 for the D-777, which was a lot of money even back then, most portable CD players were between $50 and $100. About 9 months later, I saw the newly imported D-777 for sale in Best Buy for $395. What a deal. But there still hasn’t been a CD player made that’s better than this unit. And that’s the problem with the D-777, it was a huge design accomplishment, Sony still lists it on their history website as one of their greatest products ever. But today you can get a better music experience in an iPod Shuffle that’s smaller than the Sony remote controller. The D-777 was the last, best CD player ever, I used to mix and burn my own CDs and I carried it constantly, it was so light and easy to carry. But mp3 players made it totally obsolete. 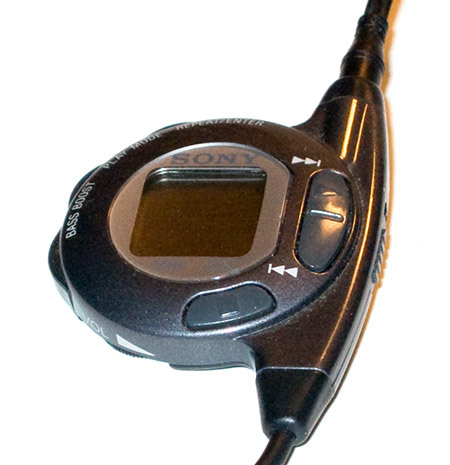 Still, Sony’s design innovations like the remote controller were very influential in the design of the next generation of mp3 players. I haven’t used my CD player in years, not since I bought my first iPod. But the speakers still work great, and I plug them into my iPod and iPhone all the time. The speaker technology is outdated, but I’ll keep using them until I find something that sounds better, and looks better. Wow, I have been searching for an SRS-T50 for so many years. Being sold only in Japan would explain why I have never found one. Hey, should you ever come across another one, as unlikely as it is, I would buy it in a heart beat. I found one of these (a T50) in a thrift store in Las Vegas last year. A friend noticed it and urged me to buy it for him, if it worked or not, for a whole $5. We got home and were amazed at the sound. When I first googled for the model I found nearly nothing, so thanks for posting about it, I was mystified. i am sitting at my pc listening to a set of the SRS-T50 right now i love these ans i will pay any thing for another set. thanks for making the site with the info. I love the design of those Sony speakers. It’s really too bad that they never released those in the US.